Security Council conducts a discussion of the attack on IDF troops in which a Spanish peacekeeper was killed as well. The United Nations Security Council held an emergency meeting late Wednesday night to discuss a flareup in violence between Israel and Lebanese terror group Hezbollah along the Israel-Lebanon border. Along with IDF soldiers Major Yochai Kalengel and Sgt. 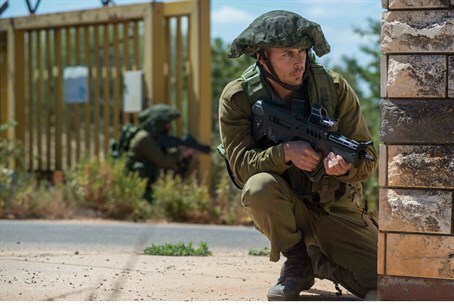 Dor Nini, who were killed when Hezbollah fired antitank missiles at two IDF vehicles, a Spanish UNIFIL peacekeeper was killed in Israel's retaliatory fire. On Wednesday, the Spanish Ambassador to the UN blamed Israel for the death of the soldier. While an investigation is ongoing, it is likely that the soldier died in an IDF response to the Hezbollah terror attack. "It is clear that this was because of the escalation of the violence and it came from the Israeli side," Spanish Ambassador Roman Oyarzun told reporters, according to the AFP news agency. Oyarzun was referring to Israel's elimination last week of Jihad Mughniyeh, said to be Hezbollah's “commander of the Golan Heights area,” along with a crew of Hezbollah terrorists, and Iranian general Abu Ali Tabtabai, as they were touring the Golan border area with the intention of planning terror attacks against Israel. Hezbollah delivered a message through UNIFIL saying that it was not seeking to increase tensions with Israel at this time. As far as the terror group is concerned, the message said, Wednesday's actions would satisfy Hezbollah's demands for revenge against Israel for last week's IDF attack. The Security Council did not release any statements on the closed, members-only meeting. Israel's UN Ambassador Ron Prosor warned in a letter that Israel was ready to take all necessary measures to defend itself and demanded that the Council condemn Hezbollah. "Israel will not stand by as Hezbollah targets Israelis," wrote Prosor in a letter to the Council that was also sent to Secretary General Ban Ki-moon.